Happy Mother’s Day! This year has special meaning to me, as it is the first year that I am a mother! So yes, there you have it. Just one of the many reasons I’ve been a little quiet on my blog lately. We have a LOT of amazing stuff going on. 2014 is THE year, I tell you. In the next month and a half we are buying a farm house on two and a half acres, selling our beautiful old city house, getting married, and going on a honeymoon to Alaska. The cream on top of it all was finding out I was pregnant! So yes, we are going to have a little shortcake come November. Another reason I’ve been quiet is that over the past couple of months I’ve spent more time trying to figure out what on earth sounded appetizing to me than actually cooking, a highly unusual dilemma for this gal who loves food. What a strange conundrum to find myself suddenly a picky eater, cropping up taste aversions day after day. I’ve eaten more eggs, rice, and soy than I ever thought possible and my fruit cravings are out of control. If I eat another pineapple I think my teeth will fall out of my head. But that little bugger is going to be so cute, it will all be worth it. And thankfully, I’m getting my appetite back and that means cooking sounds fun again. I’m back to thumbing through magazines, coming up with new recipes, and dreaming of cooking in my kitchen in our 1848 farm house. This recipe, found in this month’s issue of Cooking Light magazine, looked and sounded like perfection. And it is. So much so that it has found it’s way onto my wedding dessert menu. That decision happened the moment I took my first bite. 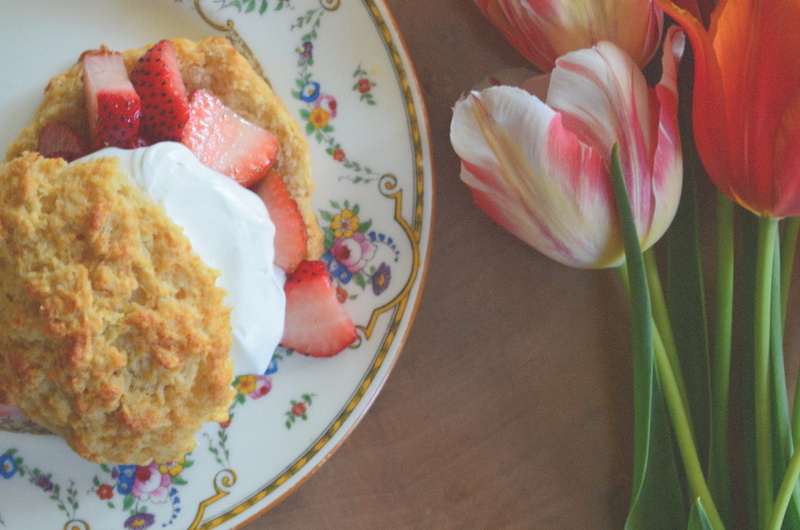 Cooking Light has magically lightened up the traditional strawberry shortcake recipe, saving almost 500 calories per serving from the classic recipe. This recipe also saves you time. It took 25 minutes from start to finish! Time is important during these busy packing, wedding planning, baby growing days and I know it’s going to become even more important come November. The CL team also came up with my new favorite dessert embellishment: yogurt whipped cream. You take a half cup Greek yogurt, a couple tablespoons of sugar, and a third cup of heavy cream and whip it up. It acts just like straight up whipped cream but is healthier and in my opinion, way better. I’m a yogurt lover so the slight tang and thick creaminess of this updated whipped cream is more than welcome in my kitchen. You can find this recipe and the nutritional breakdown here. For more delicious and healthy strawberry desserts, head over to Cooking Light’s strawberry dessert slideshow. 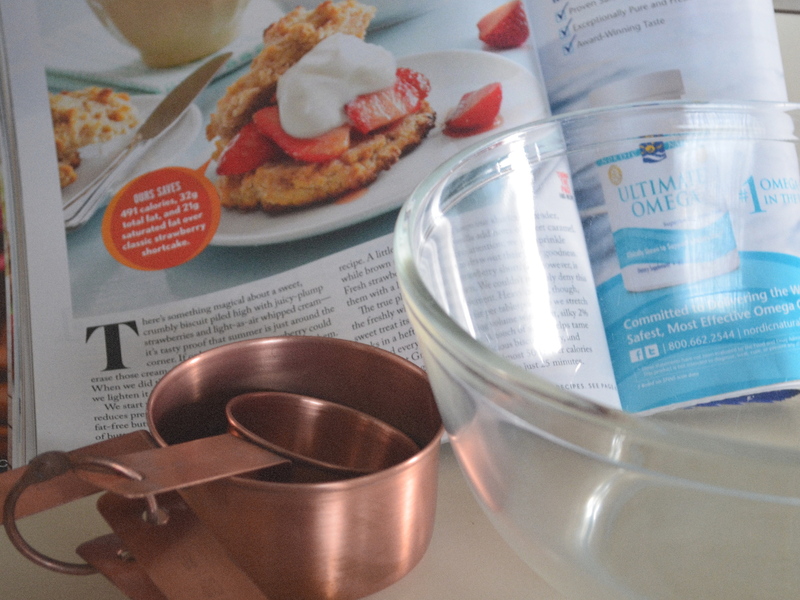 Weigh or lightly spoon flours into dry measuring cups; level with a knife. Combine flours, brown sugar, baking powder, salt, and baking soda in a large bowl, stirring with a whisk to combine. Place butter in a medium microwave-safe bowl. Microwave at HIGH for 1 minute or until melted. Add cold buttermilk, stirring until butter forms small lumps. Add oil and vanilla, stirring to combine. Drop batter into 12 mounds (about 2 heaping tablespoonfuls each) onto a baking sheet lined with parchment paper. Bake at 450° for 12 minutes or until golden. 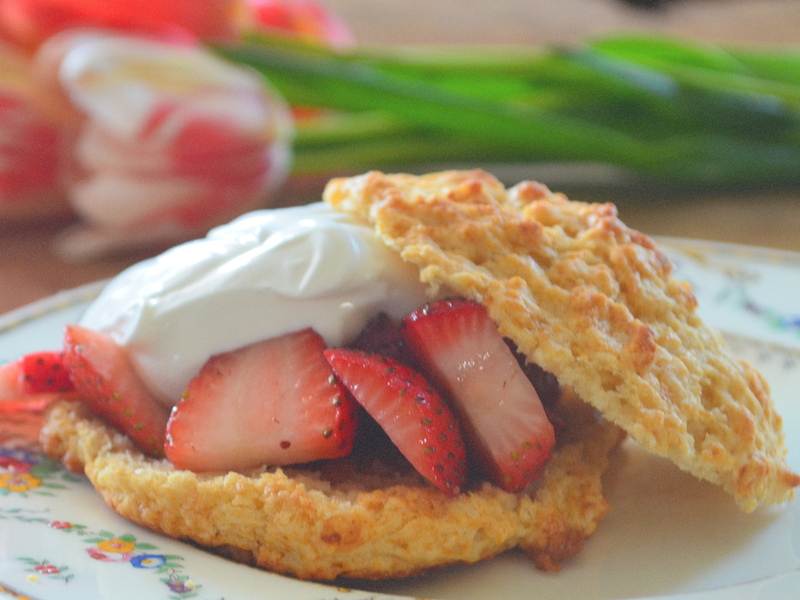 While biscuits bake, slice strawberries. Combine strawberries, 2 tablespoons sugar, and lemon juice; toss to coat. Set aside. Place yogurt, cream, and remaining 2 tablespoons sugar in a bowl; beat with a mixer at medium speed until soft peaks form. Split biscuits; fill with berry mixture and cream. Wow! what wonderful news 🙂 Congratulations to you both on your new home, your wedding and your baby! Also, thanks for another divine recipe – I look forward to giving this a go.